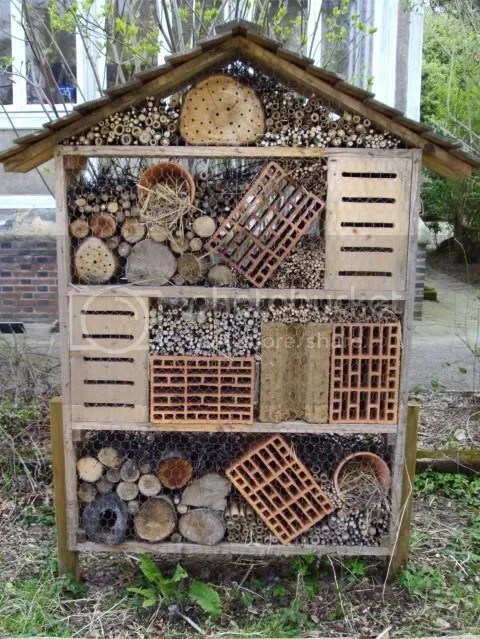 We’ve all seen the little bamboo cane winter insect apartments for sale in hardware shops and garden centres… or if we buy nature or gardening magazines, we’ve probably seen “make your own” instructions. 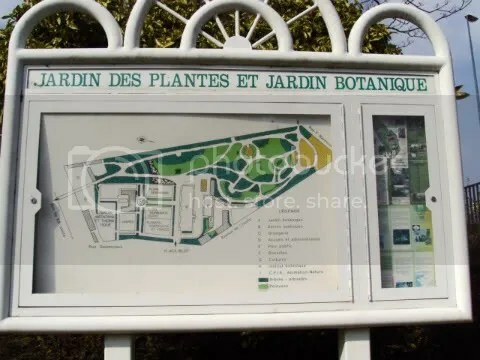 On a trip to Caen recently, we stopped off at Le jardin des plantes et le jardin botanique de Caen. About four hectares that include glasshouses (not open to the public when we were there in April) well-labelled flower beds, a physic garden and gravelled walks through shady, leafy areas with shrubs and some mature and spectacular mature trees. Cheeringly, they have paid a lot of attention to providing winter accommodation for d’insectes utiles au jardin. As well as the more usual styles, we saw a rather impressive tenement block which is obviously ideal for a fair range of insects of varying sizes and habitat preferences. The effort is definitely worthwhile – and it is surprising what insects will use to get them through hibernation. With the stunning spring weather that we’ve had since the end of March, we decided to get some of the sun umbrellas out of store to give the cats some shade during the warmest – okay, the hottest – part of the day. 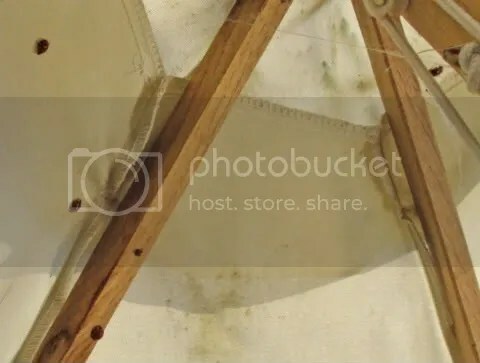 One umbrella had been stored in the wood shed over winter. Shaking it open, we spotted that we had a variety of ladybirds that had chosen it as their winter premises. I’ll be the first to agree that six visible ladybirds isn’t a great haul but what you didn’t see was the cascade of insects that dropped to the grass as we shook out the umbrella… before we realised that we were disturbing their “roost”. Having scooped up the disenfranchised and put them out of harms way in an adjacent herb bed, we had the chance to take some photos of the remainder. Viewed from below, they are surprisingly leggy creatures in comparison to their size. Now. The bad news. We all know that ladybirds are beneficial garden insects as they (and their larvae) decimate infestations of aphids, which is particularly welcome on roses, honeysuckles, broad beans and other plants that we humans rather like. 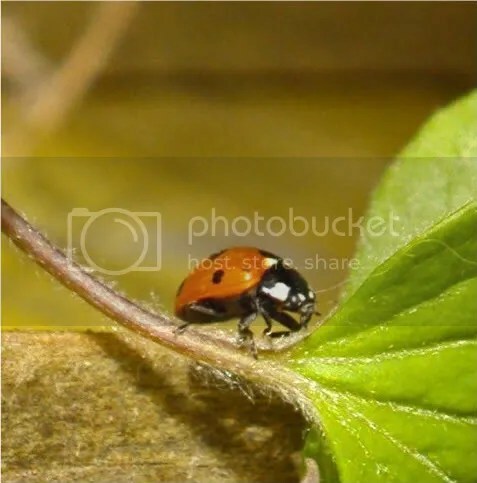 However, a relatively new arrival to northern Europe is the Harlequin ladybird – Harmonia axyridis. Like so many non-native species, their arrival is not good news for the native ladybirds. The harlequin will eat aphids but, should that foodstuff become unavailable or be in short supply, they’ll quite happily switch to eating other insect eggs, larvae and pupae as well as our native ladybirds themselves. They are equipped successfully out-compete native species. They have other unsociable habits such as emitting a smelly liquid when scared or squashed – or both – which stains. 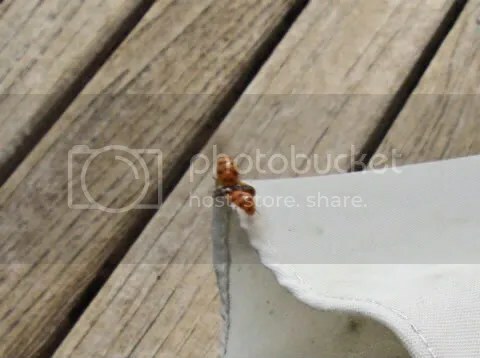 They like to overwinter indoors and homeowners have reported incursions of hundreds or even thousands of these ladybirds in late autumn and the little s*ds will even bite humans in their search for food. 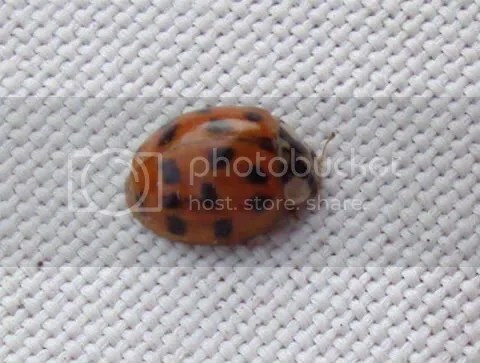 And here, below, is another… it looks like an 18-spot ladybird… however, it’s another variation of a harlequin. So, disappointingly, it appears that most of my over-wintering ladybirds turned out to be harlequins and therefore not totally welcome. But… with the warm spring and the infestations of aphids, for this year at least there’s probably more than enough food for every ladybird in the area, good or bad. This is the harlequin “eighteen-spot” getting ready for flight. I’d not looked closely at a ladybird before and had rather assumed that the spotted “bits” were the wings. How uninformed am I? They’re not. They are the wing casings and the wings – enormously fragile and long affairs – are folded origami-like beneath. 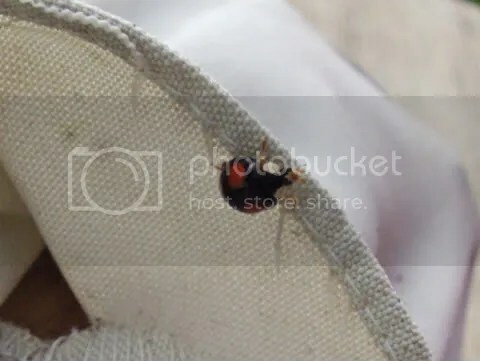 Whatever links you don’t bother clicking on normally, please do click on the link below as it shows a ladybird unfurling her wings for flight, all in slow motion. It lasts for about a minute and a half and the last 30 seconds are particularly amazing and, harlequin or not, I am now fascinated by these tiny creatures.